ABA TECHSHOW 2015: Don’t Miss It! The ABA TECHSHOW is an annual legal technology conference in Chicago, sponsored by the Law Practice Division of the ABA. The goal of the conference is to educate lawyers, legal professionals, and law firm employees on using technology in their practice. The 2015 conference will be held April 16th through the 18th, and will feature many new and recurring educational topics that are trending in legal technology. Want to find out if this conference will benefit your practice? In this episode of The Digital Edge, Sharon Nelson and Jim Calloway interview the Chair of the ABA TECHSHOW Board, Brett Burney, about the 2015 conference, what attendees can expect, and why attendance is useful to almost anyone working in the legal field. The people who should attend, Burney says, are solo and small firm lawyers, government lawyers, members of corporate legal departments, and big firm lawyers. Additionally, law firm employees such as paralegals, legal assistants, CIOs, IT professionals, law firm administrators, office administrators, litigation support professionals, and many others will benefit from the educational value of the ABA TECHSHOW. He talks about this year’s legal technology topics such as cloud computing, a paperless office, digital security, and many others, and how the board selects speakers of quality and relevance. Burney discusses how having vendors and exhibitors at the conference can help users, why a legal professional should attend for the first time, and what’s new and cool for the 2015 conference. The ABA TECHSHOW comes highly recommended by past attendees for legal professionals at any level of tech experience, from novice to expert. Brett Burney is the Chair of this year’s ABA TECHSHOW Board and is also the Principal of Burney Consultants LLC. He focuses the bulk of his time consulting on e-discovery and litigation support topics. He also works with lawyers who want to integrate Macs, iPhones, and iPads into their practice. Burney is a frequent contributor to Legal Technology News and speaks around the country on litigation support, e-discovery, Mac and iOS-related topics. Sharon D. Nelson: Welcome to the 84th edition of The Digital Edge, lawyers and technology. We’re glad to have you with us. I’m Sharon Nelson, president of Sensei Enterprises. Jim Calloway: And I’m Jim Calloway, director of the Oklahoma Bar Association management assistance program. Today our topic is ABA TECHSHOW 2015: Don’t Miss It! We are happy to welcome our friend, Brett Burney, the chair of this year’s ABA Techshow board. Brett Burney is the principal of Burney Consultants, LLC, and focuses the bulk of his time consulting on e-discovery and litigation support topics. He also works with lawyers that want to integrate Macs, iPhones and iPads into their practice. Brett is a frequent contributor to legal technology news, and speaks around the country on litigation support, e-discovery, Mac, and iOS related topics. Welcome, Brett. Brett Burney: Thank you, Jim, and thank you Sharon. It is an honor to be here with you guys and thank you for sharing an episode of The Digital Edge and focusing on Techshow. Sharon D. Nelson: Well we’re thrilled, and obviously Jim and I as former chairs of ABA Techshow, we certainly know a lot about her. But we’d like you to explain ABA Techshow for those who might be listening who might not know about the show and maybe tell us to, who should attend? Brett Burney: Yes, absolutely. The both of you have appropriately sized feet, I’m sure, but big shoes to fill. It’s been an honor to have both of you as mentors going through with this whole process, and all of the other past chairs as well. But for the benefit of your fantastic audience, the ABA Techshow is this annual legal technology conference. It’s held every year in Chicago, it’s sponsored by the law practice division of the ABA; and the whole goal of the is to help lawyers and legal professionals simply just better understand how to use technology in their practice. Our focus at Techshow is on education. We have just over 65 educational sessions with just over 70 speakers for all of those, plus we have meet the author sessions, we have a Keynote and plenary sessions, we have several sessions that are sponsored by vendors; and the focus is to have lawyers and legal professionals come there and understand how they can better use technology. So, “who should attend?” We have the whole gamut. Certainly lawyers; if you are a practicing lawyer, it is a wonderful conference to attend; but then we have everybody who supports lawyers from the paralegal assistance, the CIO’s, the I.T. professionals, law firm administrative, law office administrative, litigation support professionals. And we have attendees that come from private law firms of all sizes, really, from the 2-attorney term all the way up to the 500-attorney firm. We have in-house corporate lawyers, judicial officers, judges, officers in the armed services, government lawyers, consultants, you name it; we have the whole gamut there if everybody that works in the practice of law. I guarantee you there’s something there for everyone. Jim Calloway: Brett, let’s make sure everybody knows the basics. Where and when is ABA Techshow held this year? Brett Burney: The ABA Techshow is going to be held on April 16th through the 18th of 2015. It’s a little bit later than what we usually have, but it’s fine; it worked out with the dates across the board. It is held in the beautiful, historic Hilton Chicago or the Chicago Hilton hotel – which has obviously been a mainstay there in Chicago for many, many years. It’s a little south on Michigan Avenue, so you’re not right in the middle of the hubbub there, but you can easily get to wherever you want to go; people go there and obviously you can get to any dinner or shopping excursions that you want to on Michigan Avenue there. It’s a historic hotel that’s obviously – and both of you know, and anybody who’s attended Techshow knows – that it was originally going to be the Stevens hotel, which was actually built by the family of the former Supreme Court Justice, John Paul Stevens. In fact you could see a picture of him when he was, I think, 7 years old standing there in front of the hotel. I probably wouldn’t call it the most contemporary hotel for the purposes of a cutting edge legal technology conference, but the hotel has been absolutely fantastic for us. They have accommodated us in just about every way, that’s doing a large part, of course, to our ABA staff that works with them and the others. And it’s just become a fantastic location for the ABA Techshow. Just quickly, by the way, back to the timing on that; so it’s April 16th through the 18th, that’s Thursday through Saturday. And historically the ABA Techshow has gone all day Thursday, which will be April the 16th, all day Friday, and then we have dinners at the night and then we have a half day on Saturday. We’ve always planned it that way, so presumably, most people can get off work a little bit easier and make it a long weekend, if you will, because obviously we’re sensitive to the fact that everybody has a day job and this is taking them away from that for a couple of days. So it’s Thursday, April 16th, through Saturday, April the 18th. Sharon D. Nelson: Well thank you for all of that, and now if we can switch gears a little bit, I know every year the educational topics shift focus a little bit because things change and we have new topics that are hot, et cetera, et cetera. So what topics are the educational sessions focusing on this year, Brett? Brett Burney: I guess the easy answer would be, anything that’s relevant to how lawyers are using technology; but more specifically, one of our most popular sessions, I would say for the past 4-5 years has always been about clause computing. We have numerous people asking about clause computing and we have a whole track devoted to that. Paperless office still won’t go away; people want to know how they can be more efficient and get things done better without all of the paper. Digital security is a big deal still, while maybe even 4 or 5 years ago, that was mainly talking about how to use a password on your laptop. But today, digital security encompases so much with all the mobile devices that we carry around today, and then we have a track even just simply on mobility, still a big deal, practice management is still important, litigation support as well. And by the way, it’s kind of funny; it’s almost like the Techshow planning board listening to The Digital Edge podcast because if you look at our schedule that we have posted up now at Techshow.com, we actually have several sessions that hit on exactly the topics that your podcast has been working on. For example, I think you just had Jeff Richardson on not too long ago, he’s an attorney down in New Orleans, he’s been a wonderful Techshow speaker for many years. In fact, one of the best sessions that we have every year at Techshow it’s buried in the Techshow, it’s on that Saturday. It’s 60 iOS apps in 60 minutes; and Jeff comes and he sort of has been heading that for the past three to four years. That is a standing room only event, I think we’ve had upwards of 200 people in a room just for that session the last couple of years, and that’s great. You also had Ben Schorr on, I think not too long ago, talking about Office 365. And based on our feedback, we have now devoted two full days of sessions focused on Microsoft Office. Now that includes applications like Word, Excel and Powerpoint and OneNote and how to use that, but you can’t talk about Office today without, of course, incorporating the idea of Microsoft Office 365. So we have a session on that and that extends even into some of our iPad sessions. I’m just thinking about some of our lower sessions now because even if you use the iPad and have Microsoft Office and Word and Excel on the iPad, that uses 365 as well so we’ve got that covered. And I think the last one I saw, you just had Rick Georges on too; and what do you know, we even invited Rick to speak about wearable technology, which was a great podcast that you guys hosted. And we know that that’s a relevant topic for a lot of the attendees coming. So, just so many great sessions, I could go on and on; I’ve been so proud of my Techshow planning board, we have a how-to track, which I love. It’s sort of our catch-all, we have a session on how to use EverNote, how to balance technology and in-person Facetime. One of my favorite sessions for next year is how do you Yelp or how do you understand how people are using Yelp to maybe find lawyers, we have a session on that. You could see the entire schedule posted at techshow.com; we’ll come back to that website, but we’ve got it all posted now with the sessions and the speakers and everything there. Sharon D. Nelson: I want to know, Brett, do we get a finder’s fee? Brett Burney: We might have to talk offline. Sharon D. Nelson: Alright, alright, alright. Jim, the next question is yours. Jim Calloway: Brett, you mentioned three outstanding faculty members and one of the really distinguishing things about ABA Techshow is the depth and breadth of the knowledge of all the different speakers and the number of different speakers. How does Techshow go about selecting all of its speakers? Brett Burney: You mean besides listening to The Digital Edge podcast, right? Other than that, there actually is an awful lot of overlap not planned; but it is true that we both are sort of focusing on that edge of what is important for lawyers and technology. Do you like how I threw that in there? We have that passion for making sure that your listeners, our attendees at Techshow, truly come and learn how they can be more efficient in their technology every day. And that continues to be so important. I just want to say this for your listeners, I think it’s important for them to understand that we have always had a general rule at Techshow, and we call it, “no selling from the podium.” We think that that’s important because we continuously hear attendees say how much they appreciate the fact that when they come to Techshow and they listen to a session; you’re taking time out of your day, you’re paying to come to Techshow, is that you’re really getting something from those sessions. And so because of that, we look for practicing lawyers, we look for peers and colleagues around the country – around the world, actually – to come and actually talk to their peers, to their colleagues about what’s important. How did you work through EverNote, or how did you better learn to use Microsoft Outlook or what are some of the tips that you can share that we find that are more important in your own practice? It’s that kind of interaction, and sharing, frankly, that attendees find so important. So we go everywhere. I am so proud of my planning board this past year, obviously, it’s as both of you know, that’s where we spend the bulk of our time over this whole year planning these sessions, and not only finding the sessions that are important but also looking for the folks that we know are going to deliver the best information, the most effective, efficient information in there, so it’s from all over. We always try to get new people in, we don’t want to have the same old folks unless we know and we’re confident that they can deliver – which obviously both of you do every single year. So the planning board brings in people that they know from different locations as well. And so every show is different, which is great, and that’s what our attendees appreciate about it as well. Sharon D. Nelson: I know Jim and I have enjoyed speaking for many years at Techshow, it’s been a great honor for us. But I can remember when I was first there, probably 17 or 18 years ago, now as attendee, and I remember as a workee, it was a little bit intimidating but mostly I fell in love and became completely immersed in the show. I just couldn’t decide which of the sessions I wanted to see, there were so many conflicts and I think people still have that problem. But what have you found that past attendees generally say about Techshow? Brett Burney: Here’s what’s most exciting for me. It doesn’t matter what level of technology comfort that you have. I know folks that have come in there for the first time that they barely know how to turn the computer on, they love it. I know folks that have been doing this for years, and yet they still take something away from Techshow. So first and foremost, I have always appreciated that we focus on that, it doesn’t matter where the background that you’re coming from, you’re still going to have something to take away. The first and foremost I hear from attendees is certainly about the educational sessions. They appreciate the fact that we put so much time and energy into making sure that these are effective and relevant presentations. Next, I hear about the networking opportunities, and it’s not really the kind of networking that may turn into clients although that’s happened. But it’s the kind of networking that evolves into friendships with other legal professionals, with other lawyers, where you know you can ask them questions about technology, or maybe you can call them up or send them an email and say hey, didn’t you talk about something you were having a problem with here on this product and how did you resolve it? Or what platform did you choose to go with for your time and billing, or something along those lines. I find that networking is just invaluable for so many attendees. In fact, somebody said in one of the evaluations that I read from last year, because as both of you know, we read every single evaluation; every form that’s submitted. And somebody just talked about the camaraderie among attendees and presenters. Because it’s not just among the other attendees. Another reason we take and select speakers is simply because we know they’re going to interact and talk to the attendees and the attendees love that. And in fact, I’ll just quickly share; one of our board members received this. Randy Juip, which both of you know; he’s one of our planning board members. He first came to Techshow maybe four or five years ago – I think it was five, and he spoke on our Mac track before about how to use Mac in your practice. Well he just got a call the other day from a lady that had attended for the very first time this past year. She had some questions about using a Mac. So that was in March of this year; she still remembered Randy’s phone number, contact information, looked him up, Randy talked with her for a few moments answering some of her questions, pointing her to some resources, and obviously recommending that she come to Techshow 2015. But he shared this comment with us on the planning board and said this is why we do what we do. He said that this lady who had just attended for the first time this year said that I just wanted you to know how amazing Techshow was for me. I was really lost and after attending Techshow for the first time, I really felt like I had a handle things. You guys do really amazing things and help people in ways that you probably don’t even know. And we love that, that truly is why we do what we do. The fact that she waited all these months to ask these questions that she still could look up and have confidence that Randy would answer those questions is to me what Techshow really is about. And that’s why people come to Techshow and that’s what they talk about. Sharon D. Nelson: Well let’s pause for a commercial break, and then we’ll be right back. Advertiser: Looking for a process server you can trust? ServeNow.com is a nationwide network of local, prescreened process servers. ServeNow works with the most professional process servers in the industry, connecting your firm with process servers who embrace technology, have experience with high volume serves and understand the litigation process and rules of properly effectuating service. Find a prescreened process server today. Visit www.servenow.com. We’re glad you’re listening to Legal Talk Network. Check us out on Facebook, Twitter, and LinkedIn Too. 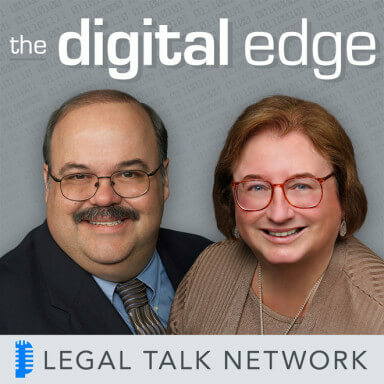 Sharon D. Nelson: Welcome back to The Digital Edge on The Legal Talk Network. Today our subject is ABA TECHSHOW 2015: Don’t Miss It! And our guest is Brett Burney, the chair of the ABA Techshow board. Jim Calloway: Brett, before the break, we were talking about our first time at ABA Techshow shared was and I have to say that’s one of the more remarkable experiences in my life as well. Maybe that identifies me as a true geek, but why don’t you expand a little bit on somebody who’s never been to Techshow before and why they might find it useful to go for the first time. Brett Burney: Absolutely. The cliche answer would be, if you’ve never been to Techshow why should you come for the first time? Because it will change your professional life. And the only reason that I am bold enough to actually use that cliche is because I’ve heard that from so many attendees, just like the lady whose comment I shared earlier. But if you want to get more serious, here’s the way that I present it to a lot of folks today. If you are a practicing lawyer or if you do anything in the realm of a law practice today, you can not employ technology. Jim and Sharon, probably both of you, how many times have we heard somebody, a practicing lawyer, say something along the lines of I’m not that computer literate, or I’m not really a techie or I’m not that tech-savvy; I hear that all the time. And I certainly realize that not everybody has a complete comfort level with computers and not everybody’s going to have that complete comfort level. But you can’t avoid the technology today just because you may not be comfortable with it. Even the Model Rules, right? A couple of years ago the ABA Model Rules were emitted to make sure that you have to have some competence in at least the risks and benefits associated with the technology that you use everyday. You’re not going to walk away a professional, being the most senior I.T. support professional anywhere, but you don’t need to; you just need to be aware of the dangers of not having a passcode on your phone, for example. Or the benefits of using a practice management software – something along those lines just so you can be a better practitioner. I tell folks a lot of times this as well, even if you, personally, are not comfortable with using a certain piece of technology or why you should be using it; the thing is that your clients today have certain expectations. And those certain expectations are starting to drive what lawyers need to know. So quickly to round that out. Randy Juip, who I mentioned earlier, himself a first-time attendee a few years ago; he calls it today – he’s even a little bit more blunt than I am – he calls it a business investment today. if you’re a practicing lawyer, and you need to understand more about the technology, then you need to invest some time and probably a little money into making sure that you understand this technology. There’s no better place to come than a conference that is specifically focused on how lawyers use technology. Jim Calloway: Why is it important to have vendors and exhibitors at ABA Techshow? Brett Burney: Well it’s the vendors and exhibitors that obviously bring the products and the services for lawyers. They’re the ones that spend the time developing it, creating products that we use as practitioners. The reason that it’s important for them to come to Techshow is because they are there to make sure that our attendees know what’s new about their product. We have vendors and exhibitors that get booths simply so that they can interact with not only their current customers, but their prospective customers. They have to issue a bunch of press releases obviously, it’s a great place to go and ask questions. If you’re already a current user of a product, exhibit hall is a great place to go there and talk with the actual developers, actually standing right there, about why they did it this why or why they can’t feature something a little bit differently. It’s a great place to find new products or other products that you may not even be aware of. If you’re using a certain billing system and you don’t have the time to go and research another billing system, but if you’re here at Techshow for two and a half days, you certainly have some time away from all the other hubbub of what you do every day that you could go talk to the actual developers and these vendors. And then along those lines, be able to compare the two, they’re all right there in the exhibit hall. Plus, the vendors and the exhibitors; they support everything we do at Techshow, from sponsoring the lanyards for our badges, for example, to the receptions, the all-important drink ticket, making sure that we have the speakers there that we need. I mean, it really is a partnership hand-in-hand; even though there may be a little bit of a wall there that we have from the educational side, but the vendors and exhibitors truly make Techshow what it is, and having that expo hall where people can just go and come and just stroll through the hall at their leisure, or maybe go specifically to one booth and talk to one developer; attendees really appreciate having all of them there, and it’s great for them to be able to answer questions there as well. They also have their own sessions a lot of times, I should add, what we call Lunch N’ Learn sessions, where there’s a session specifically focused on their product or their service and attendees love to go there so they could learn a little bit more in-depth. Sharon D. Nelson: Well let’s juice this up a little bit, Brett, and tell us what’s new and cool this year at Techshow. Brett Burney: Well, what’s cool, I think, from the cool standpoint, is that we’ve worked tirelessly and very hard on making sure that this is going to be a relevant show for everybody that’s going to come to Techshow. From the new side, I’m excited. In the expo hall rush, we’re going to have a large charging lounge that’s sponsored by one of our vendors, it’s going to be great. We had something like from that last year, but I’m even more excited. Again, in the expo hall, we’re going to have a little area called the tech support area, which I’m excited about as well. It’s for vendors that they have one booth where maybe some prospective customers could come, but then they’ll have this tech support area that if you’re a current customer, for example, you could go and really ask some in-depth questions in this area. These booths are going to actually be I.T. developers of the products there, so I’m really excited about that. We tried that a little bit this past year as well, but it was such a good success that we are doubling down on even this next year. Welcome reception, on Thursday night, we’ve had that, but we’re going to spice that up a little bit as well. I’m very excited about some of our sessions; we’ve expanded our Microsoft Office track, I think I mentioned that earlier. We had a how-to track, we’ve expanded that as well. And then there’s a few more new things that are perkulated right now. I can’t make any announcements, but stay tuned, and of course techshow.com is the best place to find out more about what’s coming up. Jim Calloway: Well, Brett, I’m going to make sure you have a chance to repeat that by saying, how do our listeners get more information about ABA Techshow? Brett Burney: Yeah, the one place you need to go to, Jim, the one place that anybody needs to go, is our website which is Techshow.com. It’s very simple, one word, www.Techshow.com, just like it’s spelled. That will be the place where you can find all the information; we have a blog there to what we can post our important announcements, we have the social media feeds if you want to follow it on Twitter or Facebook, we have our YouTube channel, which is great now. All of our schedule and all of our sessions and all the descriptions of all the sessions are now posted on there. Right after the New Year, we’re going to start bombarding folks with making sure they know where to find all of the information that they need. The pricing and registration information is located there along with the travel information, et cetera. For example, the early bird registration is now currently going on. We’ve tried pretty hard to reach out to the State Bar associations around the country as well, to make sure they have some information about signing up when they do their membership there, so you might want to check with your State Bar association. And then last but not least, on Techshow.com, I just wanted to highlight one other thing that we did do this past year, is the planning board recorded several videos about some of our experiences with Techshow, the first time that we went to Techshow, our best memories, the networking opportunities. I really hope this is going to be as effective as we intended it to be. I just wanted people, attendees, going to Techshow.com to really try to get a better feeling or extense of what Techshow means to each individual, each person, and I think these videos do it. In fact, if you go to the website right now, we’ve got a little scroller up there and my big fat head is on the top of the webpage there, that’ll get you into our YouTube channel and then you can watch all these videos. I just really enjoy this and I hope that people find them helpful because it is better, instead of maybe reading something on the webpage, to actually watch somebody talk about why they’re excited about the Techshow. So, I don’t mean to mention my big fat head, but I did want to at least point that out, I think it’s a good resource for people to go. So that’s www.Techshow.com. Sharon D. Nelson: Well you made me laugh, Brett, because I pulled up Techshow this morning just to look at the site, and I did see – I wasn’t going to call it “big fat,” but I saw you – I did see your face. Brett Burney: You screamed loudly and you ran away. Sharon D. Nelson: I actually ventured further, so there you go. Brett, this is a great show and I know Jim and I can’t wait to join you in Chicago; it’s always more fun than the law allows, and there is so much learning going on; all the speakers will tell you they learned too. In fact, we have a hard time trying to get around to all of the other sessions because we’re anxious to see them too. But you did a great job of telling us how much fun and how educational it is; and it is a business investment, our friend Randy is absolutely right about that. Thank you so much for taking time to be with us today Brett, we really enjoyed it. Brett Burney: Thank you Sharon and thank you Jim, I always enjoy talking with you guys; so thanks for devoting a few minutes here just to let people know more about Techshow. Sharon D. Nelson: And this does it for this edition of The Digital Edge, lawyers and technology. Remember, you can subscribe to all the editions of this podcast at LegalTalkNetwork.com, or on iTunes; and if you enjoyed our podcast, please rate us on iTunes. Jim Calloway: Thanks for joining us; goodbye Ms. Sharon.